Is your website’s long membership registration form negatively affecting your marketing efforts? According to a new study, it could be. The Consumer Perceptions of Social Login Study, which was conducted by Blue Research and commissioned by Janrain, reveals that 98 percent of consumers claim that they have been mistargeted by marketers. However, this is typically not the fault of the marketer, because 83 percent of the survey respondents also admit to giving false or incomplete information when registering at a website. One way that marketers can avoid obtaining false information from consumers is by offering social login on websites. This is because social login allows site owners to collect more accurate date that is derived from social profiles. Not only can this feature improve a brand’s marketing efforts, but also traffic and engagement metrics. In fact, the study found that 92 percent of consumers have left a website instead of resetting or recovering their login information, and 64 percent of consumers who frequently leave sites when login information is forgotten think that social login would be a helpful feature. That being said, another reason why consumers prefer social login is because it helps personalize their online experiences. According to 67 percent of the respondents, social login’s ability to deliver a more personalized experience, which includes delivering relevant ads, is highly attractive. Moreover, 65 percent of consumers agree that they would be more likely to return to a website that remembers them without a username or password. However, for companies, one of the biggest benefits of offering social login is its potential to help acquire new customers and increase conversions. This is because social login not only makes it easy for consumers to register on a website, but it also makes it easy for site visitors to share content with their social network – which provides brands with free word-of-mouth advertising. For example, 78 percent of the survey respondents say that they have navigated to a website as a result of a mention from someone within their social network, while 72 percent have considered purchasing a new product or service after viewing a positive comment or message from someone within their social network. 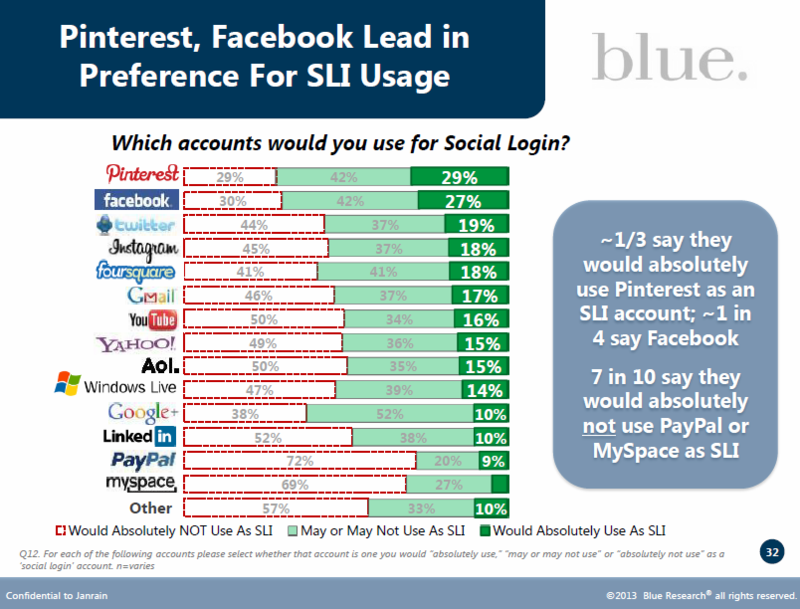 Now for the biggest surprise of the study – most consumers would prefer to use their Pinterest credentials when signing up for social login. While this social network has seen a lot of success over the last year, it is a bit of a shocker that more people would choose to use their Pinterest account for signing into a website than the world’s number one social network – Facebook.